Just like a goal at work or a gymnast competing…each athlete, person, team member needs support from coaches, family, friends, etc. Check back weekly to see other CCC Coaches in the CCC Coach Corner! Dan is a great friend of mine…and a superstar in the running community. Dan’s accomplishment’s are shown with flying colors but what makes him a CCC Motivator…his generosity as he motivates other’s to take that first (or second) step. Can I give more? I always stuck with that…it’s also on my RoadID to remind me of it. Usually, the answer is yes, you can. I went with it because by giving 100% in training you make running the race 100x easier…not that it’s ever easy running a marathon, but by slacking in training you’re only hurting yourself. Constantly asking if you’re giving 100% is great way to keep motivated. Why did you decide to start training? A group of friends and I decided to form a pseudo-running group in January of 2009, the same year I graduated from college with my undergraduate degree. Throughout college I had played ultimate frisbee and enjoyed it; however, I had reached the limit of the sport and found that I no longer enjoyed it as much as I once had. I knew I had to do something to stay fit; I despised the idea of not exercising. I had run track all through high school and really enjoyed it. I’d garnered varsity letters and all-region honors; it seemed like a good thing to get into seriously and one that I knew I’d at least enjoy. Our group ran the Jingle All The Way 10k in December of 2009 and did well. We agreed to run the Ragnar Relay together which is a 196-mile relay race that took place the following September. This is where my “training” really began. I knew if in didn’t start training for the race properly I’d let my team down. We did well and I enjoyed crossing the line of Ragnar so much after putting in so much work that I knew I had to keep that felling going. 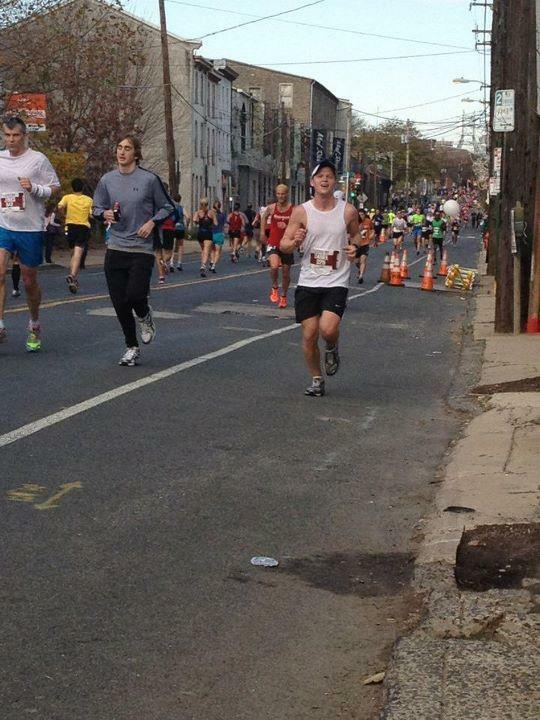 It was at that point I set the goal to complete the Philadelphia Marathon. Did you think you “weren’t going to make it”? Definitely. A lot. All the time. One bad run can put you in a terrible mood for days, particularly if it’s close to race day. On one occasion, I vividly remember being scheduled to run 10miles and only getting out 5 before feeling like I wanted to just curl up and go back to bed. I didn’t ask myself, can I give more that day and went home…however, the next weeks long run of 11 miles went great. Just one of one days sometimes. It is important I think, to remember that one bad run or workout doesn’t define the entire body of work. I even thought I wouldnt make it during the marathon once or twice…then I would look around, remember what I was doing and keep on trucking. With less than 800m to go in Philadelphia I got a terrible cramp in my right quad….it was exceptionally painful and I began to walk. Right at that moment I heard my coach (Matt Ciociola, ETA Coach LLC) from the crowd yelling “keep going keep moving! Push through!). He was right at the perfect spot at the perfect time. It just goes to show, I think, that as much as we think running is an individual sport, it requires an entire team of people. More on this below…. How did you get to the start line? What kept you going during your training? In high school, I had been lucky enough to experience the feeling of training for something and arriving at the finish line. I wanted that feeling again. Further, I knew that by running I was taking a positive step in my overall health and wellbeing. I knew based upon my training notes, that the days I ran, I felt better, I ate better, and I was more pleasant to those around me. So my will to train came from knowing that this was good for me. How I got to the start line is a longer story. Obviously, training got me there; I was lucky enough to have a coach that believed in me and designed a plan that helped me reach my goals. 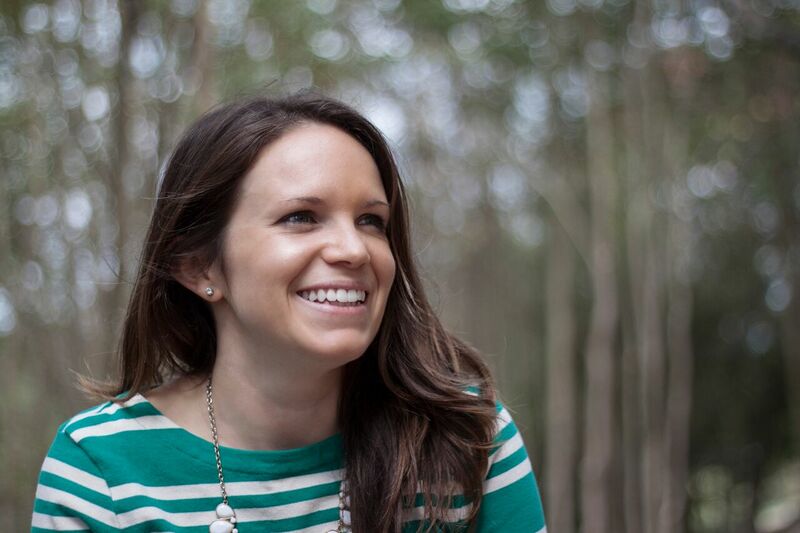 I recommend outside coaching highly for those who have a serious goal to attain. First, if you’re paying for it you’ll get out the door everyday, plain and simple; you don’t want to waste money. Second, having someone who is able to give you critical feedback about your performance and make changes daily based upon your results is invaluabe. 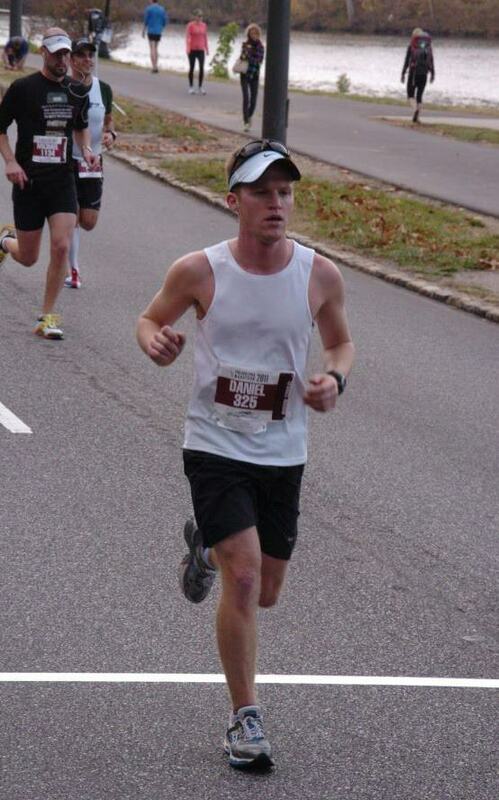 Training got me there too: I started training for Philadelphia in April of 2011 and kept at it right through race day. Continually getting out every day is the key. No matter what, get out the door. If there’s three feet of snow outside, do something. Find a treadmill, do some ab exercises, something so you’re moving forward. Finally, people got me there. This would have been impossible to accomplish without the people who supported me. Gabby, my girlfriend, pushed me to train everyday and was essentially my servant throught race weekend, making sure I had everything I needed, holding things, keeping me warm at the start line, etc. Further she made the sacrifice of sitting at home while I ran every day. My parents drove me to the race, prepared meals that fit my needs and were there to support me. I’ve mentioned Matt, my coach, whose role can’t be understated either. Friends from every portion of my life came to support me which, I think, has been the most touching feeling I’ve ever had. Erin came from Connecticut to watch, Cara from DC, and Liz from NJ. EJ, Jackie, and Maggie woke up early to stand out on the street in Manayunk to await my arrival. I absolutely could not have finished without their support. It would not have been possible at all. I high fived Bart Yasso (Definite highlight!) and shook the mayors hand and my next thought was a mixture of extreme joy and extreme pain, extreme happiness and the need to fall down. I had accomplished something that defined me, “I am a 3:14 marathoner”. That’s what I felt. And the need to eat something and drink some of the chicken broth they had available, which literally smelled like heaven. After completing your marathon, would you ever regret what you did? No. Absolutely not. Compare the length of my answers to the previous questions and this one to know how strongly I feel about this. 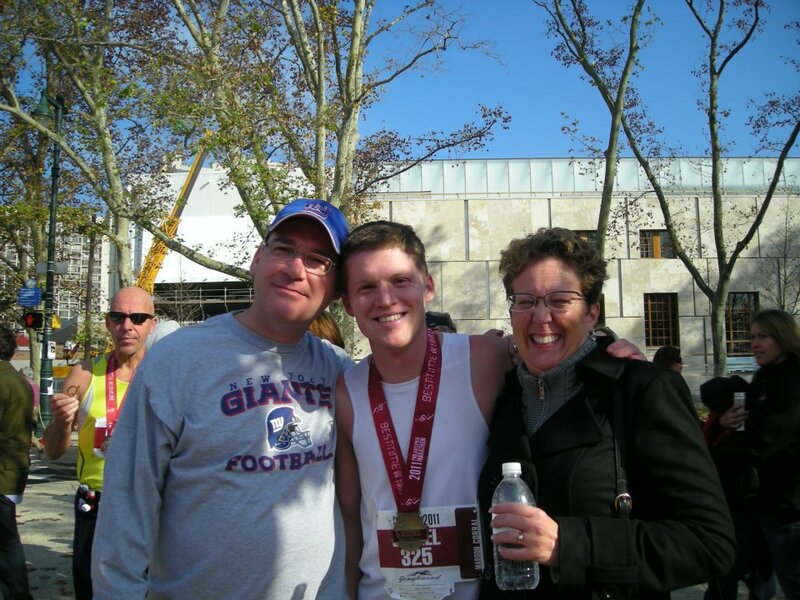 Dan with his Parents after finishing the Philadelphia Marathon! Come back tomorrow to see Dan’s Top 3 tips to help YOU!